Japan has been unified. After years of turmoil and uncertainty, a new Shogun has brought the warring provinces under his control through cunning diplomacy and ruthless conquest. But that doesn’t mean all the fun has to stop! Now the emperor’s conniving court officials, governors, and generals squabble behind the scene – or rather in plain sight – for the Shogun’s favor. Peace is such an illusory concept. In Shitennō, you assume the roles of officials in the Shogun’s court vying for influence in Japan’s various provinces. To exert power in these areas, you will use troops or spend Koku to place control makers. Each time you place a marker, you earn points; plus you can earn bonus points for each majority you’ve achieved at the end of the game. There are only two types of “currency” in Shitennō – troops and Koku – and both are represented by cards. With these, you will compete for provincial influence and must manage them effectively to win. Pretty much standard stuff. However, the manner in which these resources are allocated is, while not a completely novel mechanic, one rarely utilized in games. At the start of each round, the player with the current highest courtly title (there are four ranks) is declared the Tairō. That individual draws a number of troop cards and Koku as determined by the number of players. From this random pool, the Tairō takes any number and type of cards he/she wishes, adds one title card, and offers this lot to the next player in rank. That person can accept the lot, or pass it to the next official who decides, and so on. It’s sort of like card drafting, only in reverse. 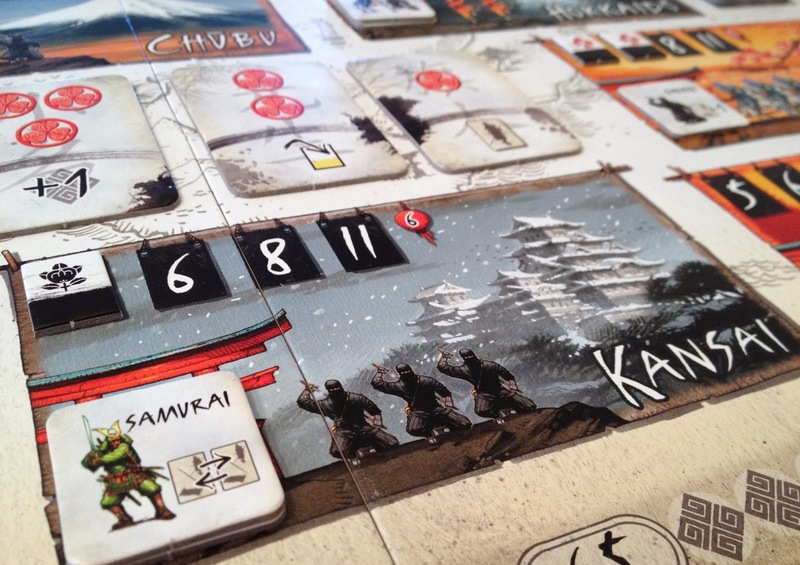 If a player takes a lot, then the Tairō selects more cards, adds a different title card, and repeats the process. If all players refuse a set, the Tairō must take it and the player next in rank becomes the new Tairō. If players take all of the Tairō’s lots, then he/she picks up the last lot. Next, everyone uses their troops and Koku to gain influence. They may play in up to two areas, with the turn order based upon the titles that each player received during the “I divide, you decide” allocation phase. You can claim regions by “conquest” (with troops) or “bribery” (with Koku). Each province specifies the required amount in either currency. In troops, the number and type are a fixed amount, with bonus tiles providing a little variation. In Koku, the cost steadily rises the more that players control a province. Provinces can only hold a total of four control markers, each successive occasion awarding more points to the claimant. 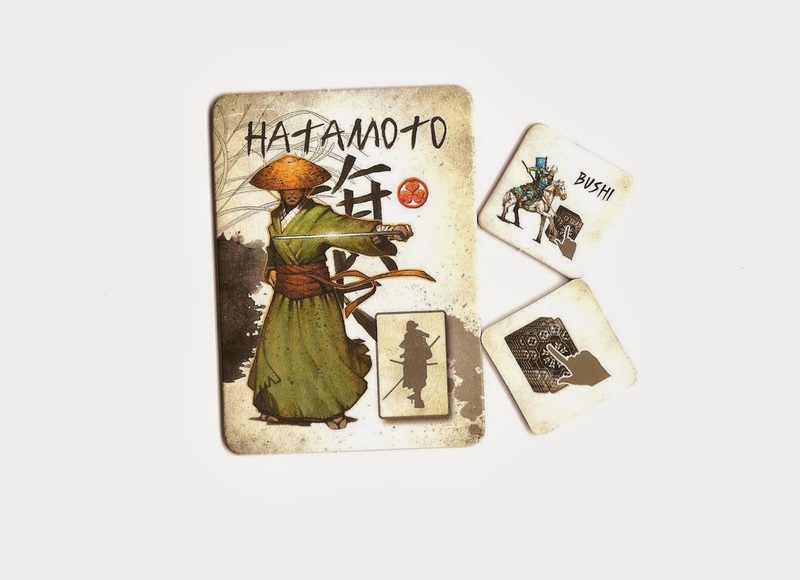 So that you’re not completely beholden to how your fellow Tairō allocate troops and Koku on their turns, Shitennō also includes bonus tiles. These are placed three per region and awarded when claiming influence in the provinces. They let you manipulate resources to some degree. Additionally, each title comes with a special power that you can use while you hold that rank. Three of them are geared toward earning extra points while the fourth counts as a wild troop card, helping you claim an area by conquest. 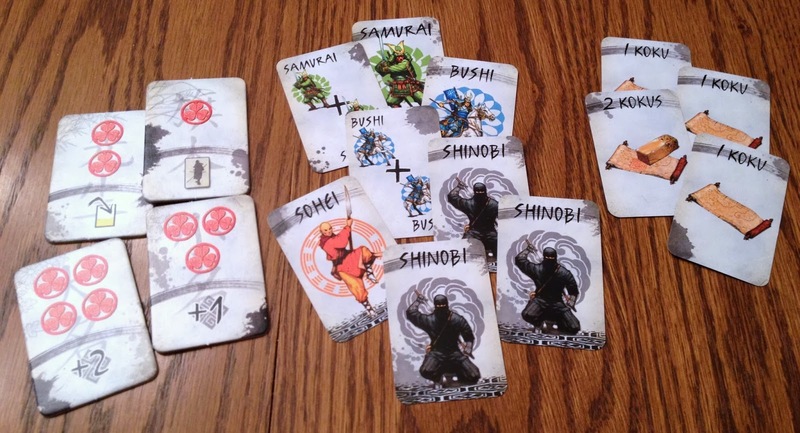 The game ends when one player runs out of control markers or when the Koku deck is depleted. Players add to their running tally 6 points for each majority achieved in the eight individual provinces. If there is no majority, the player who placed first in that province receives the bonus. Then everyone adds one point per extra Koku in their hand. 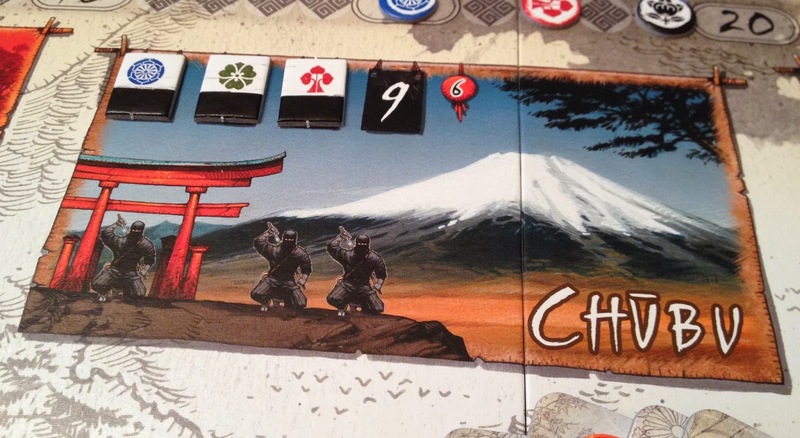 The player with the most points becomes the Shogun’s most favored official. Don’t feel too proud, though. From what I know of plotting and intrigue in Japan during this period, you’ll be assassinated within the year. Cut Your Cake and Eat It, Too? So, I’m never one to claim that board games make you feel like “you’re really there.” After all, it’s so much paper, plastic, and cardboard. But some games craft an experience from which you can imagine leading armies, discovering treasure, seeking adventure, or gunning for the sheriff. Some games create stark images with thematic art, fancy components, gratuitous chrome, and juicy conflict. Those games project more than mathematical mechanics or rules to craft an engaging experience beyond board, cards, and bits. And then there are games like Shitennō. Don’t get me wrong…Shitennō is a fine game. Yet, it is decidedly more cerebral. It’s not overly-complex or intensely brain-burning, which is good for accessibility. Plus the “I divide/You decide” manner of parceling out resources is interesting and unusual. Then spending those resources as efficiently as possible to earn points provides a smart, puzzle-like element. Just know that the design comes down to dividing, collecting, spending, and placing without any grander thematic narrative, despite the pretense of Middle Ages Japan. Golden Kamons for the majority! Shitennō is all about its card drafting, resource allocation method. The divide-by-lots mechanic drives this game, sets it apart from other titles, and presents its most interesting characteristic, as well as its most glaring flaw. On a positive point, the “I divide/You decide” mechanic is more strategic than I first thought. It’s tense and fun. There are two ways to approach divvying up the spoils. You can hold back the resources that you want, hoping to grab them as leftovers at the end. In that case, you need to make the first lots attractive enough that other players are willing to take them. Otherwise, you get stuck with it. Or you can put something that you really need in an early lot and include something less attractive, hoping that everyone else will pass so that if falls to you. Either tactic requires some bluffing and deduction. There is a very delicate balance between making lots attractive without giving your opponents too much of an advantage. Which leads to the one issue associated with all of this: Shitennō can suffer mightily from analysis paralysis. The problem is that the card drafting presents players with up to a dozen cards. From this pool, the Tairō must examine what he/she needs and decide how to divide everything up to essentially manipulate who gets which troops and what amount of Koku. However, you don’t know what your opponents have, unless you can count cards. This lack of information leads to hesitation, indecision, and second-guessing – or analysis paralysis. The resultant increase in downtime for others at the table can lead to frustration. The indecision and tension really mount as the game progresses. To begin with, all of the provinces are open and you can generally use most any type of troop you’re allocated. Therefore, players typically aren’t as picky, so the pressure’s off a little. But as the board’s influence spots fill up, specific resources climb up the demand ladder. When a few regions are maxed out with control markers, then the angst of dividing cards is really acute. It may actually be of benefit to not be the Tairō at that point! This mounting pressure naturally fits with the design’s concept and gives it some tangible character in lieu of any thematic narrative. Aside from its central allocation mechanic, Shitennō is a standard resource management game. With a limited number of turns – and the ability to place at most two influence markers – the most efficient player will generally prove the winner. First, you must be economical with your cards. Now the majority of troops cards depict a single troop type. So spending one troop card to match a province’s requisite type is merely one-for-one – admittedly not much grist for the efficiency mill. However, some cards have two troop types. When you get these – and you will – it behooves you to spend the card when you can match both types with the region you’re placing influence. This lets you keep an extra card you might otherwise need to spend and the savings adds up. Koku, meanwhile, comes in three denominations. Rarely should you overspend, because you don’t get change back. The only time you might consider overpaying is when you have no other means of grabbing a majority somewhere. Early on, when bribery is pretty cheap, it’s unlikely you’ll have enough Koku to buy influence. Late in the game, as the cost rises, it’s more beneficial to spend troops for regional control. That’s because Koku are worth 1 point each at the end of the game. You could spend it on a province and earn that number of points for immediate influence. However, if you can take the same territory with troops instead, then you keep the Koku for its extra points at the end of the game. 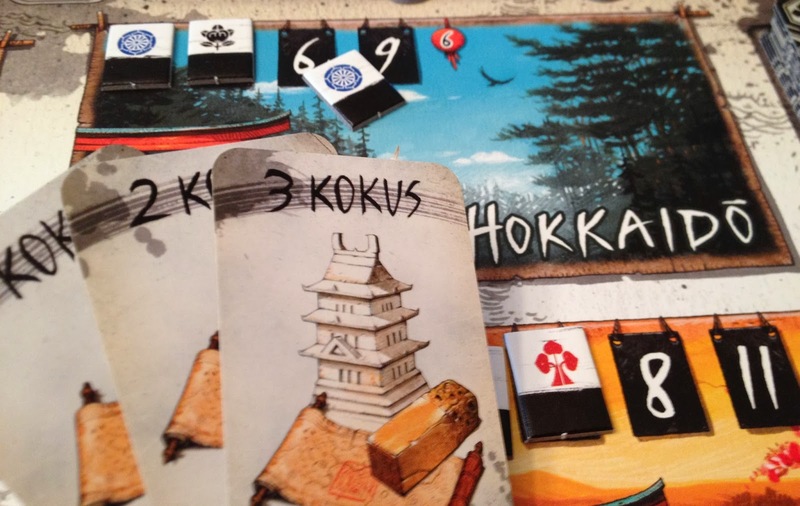 One way to turn a single Koku into a handsome profit of points is with a bonus tile. One of these rewards allows you to parlay a resource card for another type. Exchanging one category of troop for another is handy enough. But more rewarding is turning a 1-value Koku into that missing troop card needed capture a region and instead score a handful of points. Use this tile at game’s end, also, to turn an unused troop card into a Koku – every point counts. Another bonus chip lets you draw an extra troop card. The third bonus tile serves as a troop card when used, but must match another kind that you’ve already played. Bonuses are seeded to provinces randomly. Sometimes you’ll be able to maneuver for a particular one; other times not so much. Either way, these are one-time benefits and discarded when used, so plan carefully and, yes, efficiently. The powers associated with each role also give you nifty ways to practice proficiency. The top two ranks grant +2 and +1 points respectively per control marker placed. The third official allows you to flip a control marker to its golden side, which counts as two towards regional majority. The last title serves as any one troop of its owner’s choice for one conquest that turn. Title tile and bonus chips. Besides bonus tiles and role abilities, Shitennō has other elements to create some decent variability. The titles themselves change during the resource allocation phase, so each player will get to utilize different ones through one session. However, the distribution is not a uniform rotation, so there’s no guarantee you’ll get to have a turn at all four of them, though it’s more likely you will get each one at least once. Since turn order is based on titles, that will change up from round to round, as well. Finally, the design forces players to act. The two-placement limit per turn discourages hoarding; all of those resources are worthless if you can’t convert them into points fast enough in the second half of the game. So you need to work with you get, based on how the board’s set-up. The game scales a little differently than most designs in the hobby. Sessions are actually a little faster with more players. It’s not a huge difference, but should appeal to many gamers when considering that most titles tack on extra time when adding players. The 4-player variant provides the most tension. The game will last only six rounds, so you have fewer opportunities to score points. Also, it’s harder to keep track of which opponents have been collecting which troops, so dividing resources by lot will seem less informed. Finally, there’s more competition for influence which leads to a challenge in gaining provincial majorities. 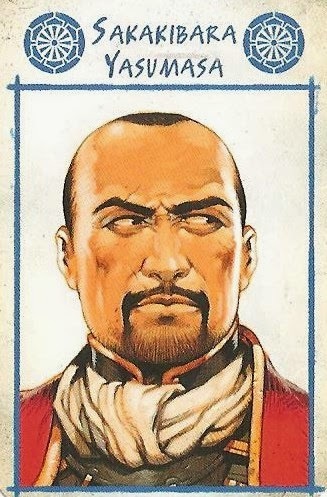 Subsequently, merely placing first, twice, or using the Sensei to flip a marker to its golden side in a territory can often be enough to reap the nice bonus reward. The components are of good quality all around. The board is compact, clean, and uncongested, yet accommodates everything that needs to be tracked. The cardboard tiles and tokens are nice and hefty. The cards are fine, as well, although the smaller European size. The artwork is very good and provides sufficient window-dressing to the game’s supposed theme. 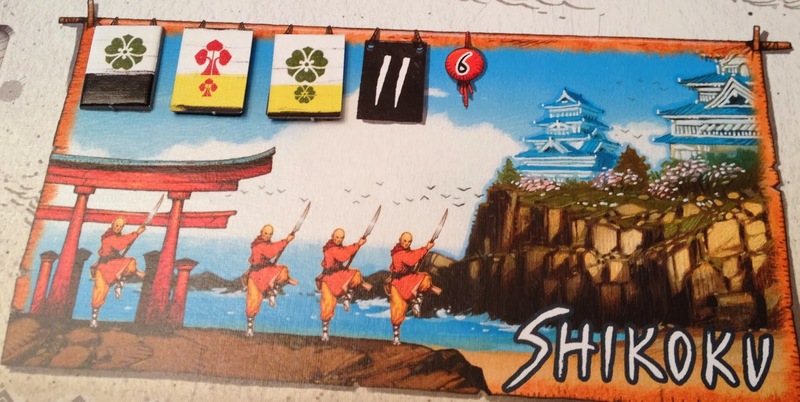 Shitennō is an accessible title with straight-forward rules. However, it is thematically dry. The unique resource allocation method provides a dose of tension and gives the players control, but can also create indecision and downtime. While the process of collecting and spending cards to place basic markers in generic boxes is rather pedestrian, there is nonetheless some subtle strategy lying beneath. Also, there is little player interaction, and only indirectly at that. Therefore, Shitennō is a light to middle weight title eschewing conflict, chaos, luck, and theme in favor of smart mechanics, especially the rarely used “I decide/You divide” element. In other words, I doubt that the politicians and generals of Sengoku Japan would have played it; but it should sit well with today’s Euro gamers. 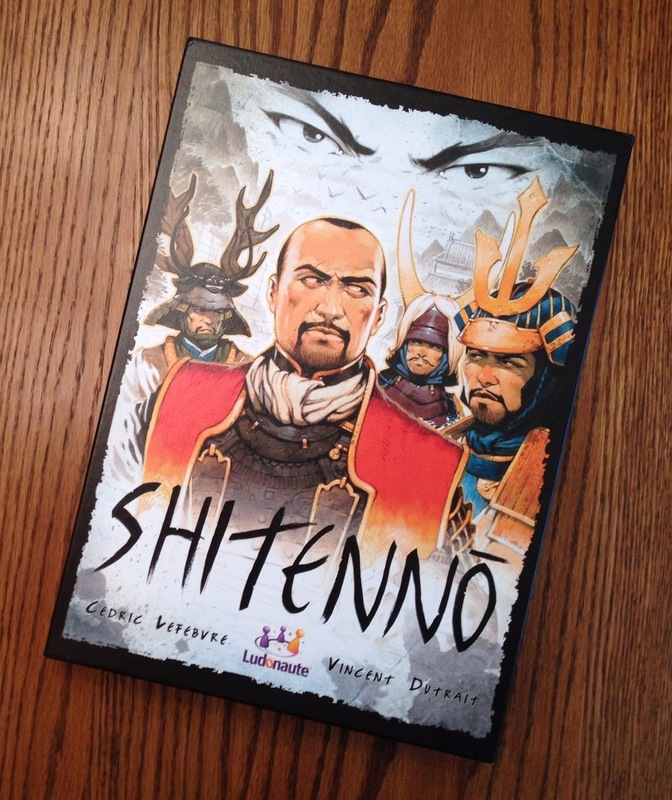 iSlaytheDragon would like to thank Game Salute for providing a review copy of Shitennō.